Those of you who have been following the blog will be familiar with the work of this month’s guest writer, Rob Shearer. Rob was the photographer of many of the contemporary shots of our older projects that were necessitated by a particular angle I was taking in the story about the legacy projects in 2015. Rob had a good eye, and more often than not I would select one of his images and not the one I sent him to get. As I discussed the week’s assignment with him, his laid back personality belied the passion he had for photography. However, as we worked on more stories it became evidently clear how seriously he took his task. As Rob outlines below there are two schools of thought about picking your vocation and your avocation. One, “do what you love, and the money will follow.” The other is “don’t let money, schedule, and clients compromise your passion.” Rob has found a way to practice and balance these competing ideas in his choice of architecture and photography as his vocation and avocation. Read on to learn a little about Rob and how he has found that balance and creative voice. I’ve been working at DiMella Shaffer for twelve years, and at this point, a number of people in the firm are aware of my interest in photography. Fortunately, they occasionally ask me to take photos of various projects, people, or events, and I get to bring a little of my avocation to my vocation. If you follow the blog, you’ve probably seen some of my photos. A little background on me …. In the later semesters of my architectural education, I decided to take elective courses in photography. I’d been taking photos for a long time, but gaining a deeper understanding of the technical and artistic aspects of photography was immensely gratifying. I dove into it with a passion, and more than twenty years into a career in architecture, I remain enamored of the medium. I love that I get to bring some of this passion for photography to DiMella Shaffer, as architecture is often the subject of my photos. But what I’ve captured for the firm is a bit different than what you would find on my website, Instagram feed or Facebook page. When I’m taking photos for the firm, it’s very much about documentation; I want to clearly and accurately (and attractively) describe the subjects. Here are a couple of exterior photos I took of recent DSA projects (the Fuse apartment complex in Cambridge, MA and the Sitkowski School apartments in Webster, MA). The intent of these photos is less documentary and more artistic. It’s not important that the viewer understand the overall massing or scale of the project; rather, I want to communicate a more artistic sense of the building – its forms, lines, and patterns. 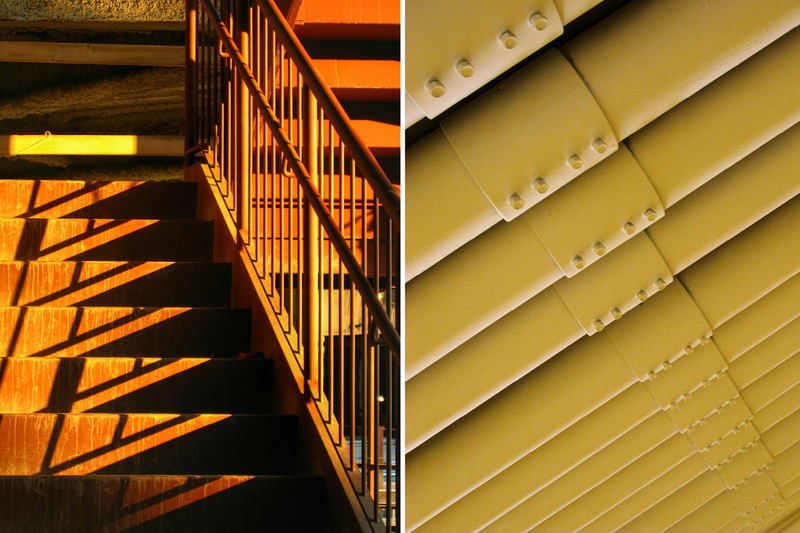 These types of images communicate a more personal perspective – what I find personally appealing about the building. These shots tend to be more intimate and intriguing, and I think they convey more than just what’s there. These are glimpses through my personal lens; it’s how I see things. This is what I keep working at, ‘transcending the inevitable function as document.’ When I take photos for the firm, the focus is documentary by necessity; otherwise, I try to let go of how an image is supposed to look. I am an editor, a photographer who believes that the art in the medium comes, at least in part, with the decisions we make after an image is captured. It’s up to the artist to ultimately decide how the photographic image is rendered. These decisions, this editing, help push the medium beyond its ‘inevitable function as document.’ In the last few years, I’ve become interested in creating graphic manipulations from my photos, in an effort to create something clearly beyond their documentary nature. I’m drawn to architecture as a subject for my photos, but I want to push myself and the viewer to see more, or at least something unique. 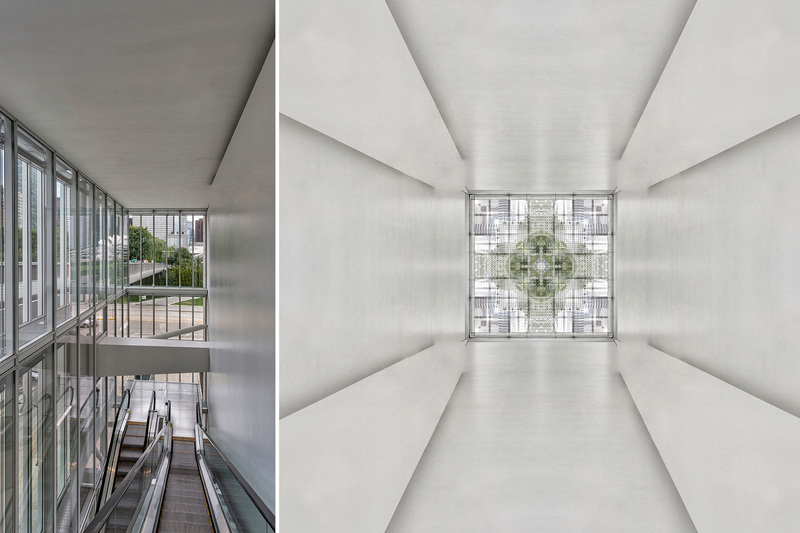 So, I look at a cityscape, a hallway, an interior space … and I see patterns. 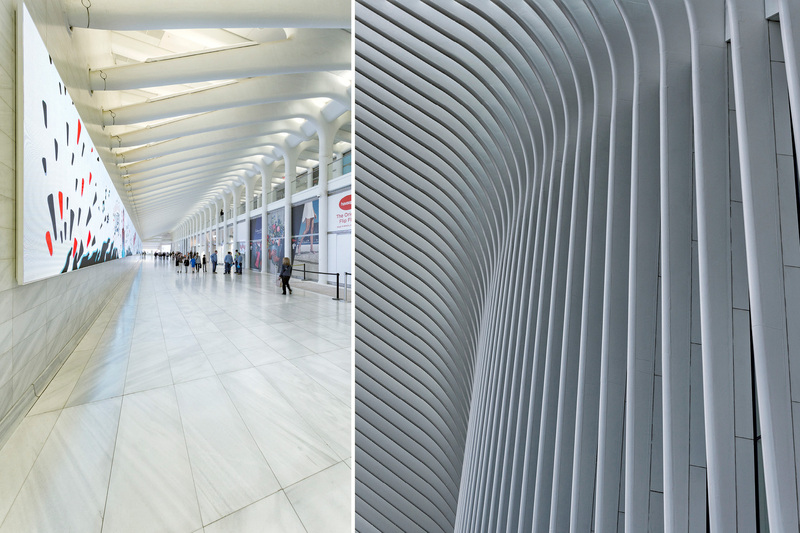 The images below were created from my photos of the Oculus at the World Trade Center, by Santiago Calatrava. It’s an elegant, beautiful structure, and I have plenty of shots that are more representational/documentary – but then, so do lots of other people. You’ve probably seen photos similar to these; this building has gotten a lot of press not only for its design and prominent location in New York, but also for finishing behind schedule and more than a little over budget. These are still very much photographs, but they’re not at all documentary. The interpretations are architectural, though I think the architecture in each image is unique, different than its source material. I don’t just take pictures of buildings; I take lots of photographs of landscapes, too – and I’ve done a little bit of portrait work. But for the sake of a photography post on a blog about architecture, I’ve tried to narrow the scope for this particular audience. If you’re interested in seeing more, check out any of the links at the end of the post. I suppose my background in architecture informs my work in photography – my vocation serving as inspiration for my avocation. Regardless of what’s in front of the lens, I feel good about the attempt to create something new – particularly at a time when almost everyone is walking around with a camera in their pocket. It’s difficult to have an original, appealing voice, but that goal keeps creative professionals motivated. My voice may not be terribly original as an architect, but my work in photography has eased my anxiety about that. There’s a school of thought that warns against avocation as vocation. This thinking suggests one cannot remain as passionate about something when depending on it to make a living; there are just too many compromises, in order to guarantee income and security. I don’t believe this is universally true, but plenty of people have experienced at least some truth in the idea, particularly in regard to creative pursuits (like architecture, or photography). There’s a freedom in avocation that is more difficult to achieve within one’s vocation. Architects are a creative bunch, and I think many of us need these extracurricular pursuits, to offset the constraints we feel at work. At one point I was determined to change course and pursue photography as a career, but I’ve made peace with the different roles architecture and photography play in my life. They work together, and hopefully each is helping me in my approach to the other.